Appi Kogen is about 14km to the north west of the Matsuo Hachimantai IC on the Tohoku Expressway. From the northern Tokyo region, take the Tohoku Expressway north until Matsuo Hachimantai IC. Exit the expressway at Matsuo Hachimantai IC and turn left onto Prefecture Road 45. After just over 200m turn left to continue on Prefecture Road 45. Turn left here and continue for about 3km until reaching the main Route 282 road. Turn left onto Route 282 and continue for about 8km until reaching some traffic lights with a Lawson convenience store on the left hand side. Appi Kogen is signposted at this junction - turn left and follow the signs for a few kilometres up to the Appi Kogen resort base. Appi Kogen is about 15km to the south of the Ashiro IC exit on the Tohoku Expressway. From the Ashiro IC exit, turn right onto Route 282 to head south towards 'Appi Heights' (as it is signposted) and Morioka. Continue on Route 282 for around 13km until reaching the signposted turn for Appi Kogen. Turn right and follow the signs for a few kilometres to the Appi Kogen resort. Appi Kogen to Hachimantai Resort About 25km From Appi Kogen head back to Route 282 and turn right onto that road heading south for about 8km. Turn right onto Prefecture Road 45 heading towards the Matsuo Hachimantai IC of the Tohoku Expressway. Continue under the expressway and past the IC exit for a further 6km until reaching the Prefecture Road 23 junction (signposted as Matsukawa and Hachimantai). Turn left onto Road 23 and then after the traffic lights turn onto Prefecture Road 212 and follow the road to either the Shimokura or Panorama resort. Appi Kogen to Shizukuishi About 68km From Appi Kogen head back to Route 282 and turn right onto that road heading south for about 8km. Turn right onto Prefecture Road 45 heading towards the Matsuo Hachimantai IC of the Tohoku Expressway. Join the expressway heading south until reaching the Morioka IC after around 31km. Exit the expressway at Morioka IC and keep on the right side lane signposted as Akita and Shizukuishi. Head west on Route 46 for 13km. Turn right onto Prefecture Road 212 and continue on that road for about 6.5km until reaching a sign for the resort and turn off to the left. Turn left here and follow the signs up to Shizukushi resort base. 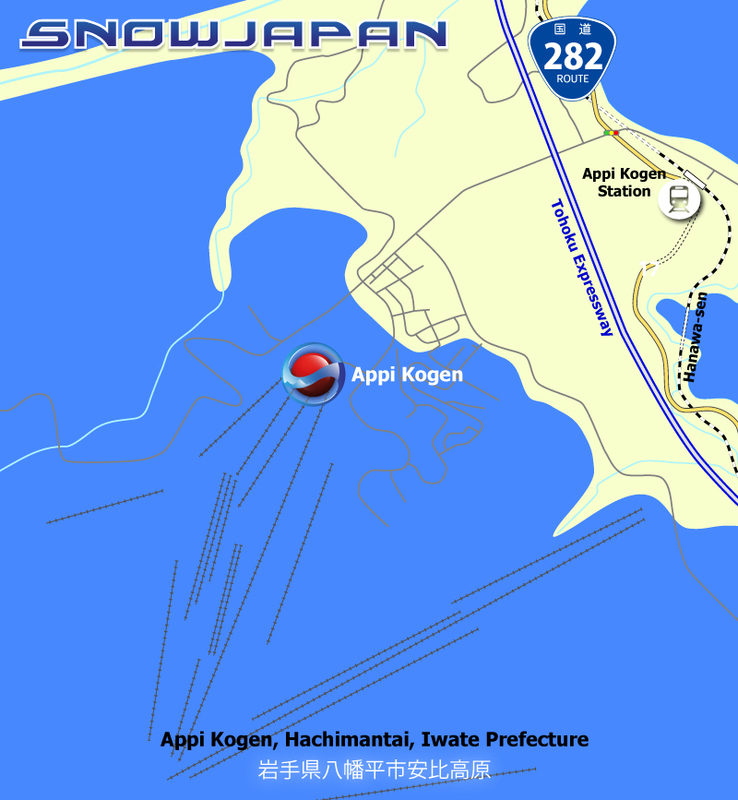 For detailed information on how to get to Appi Kogen by train and public transport, please go to this section.